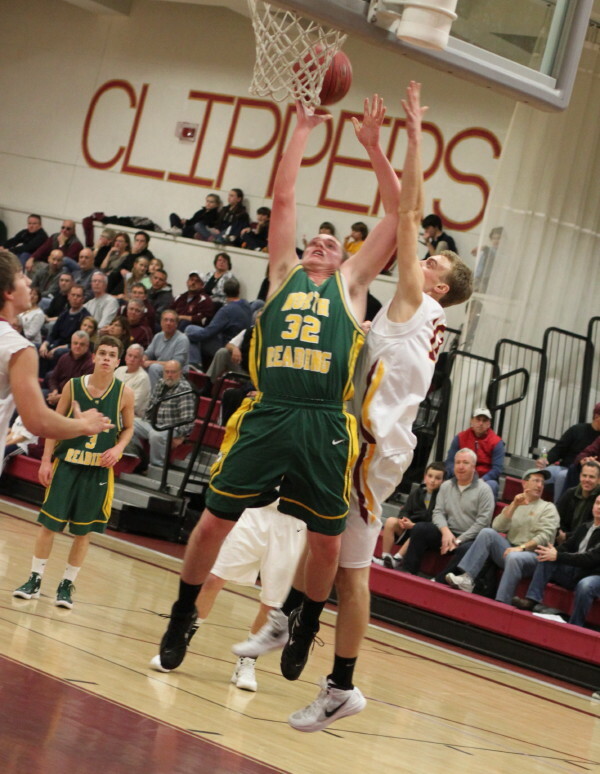 Colby Morris launches big three late in the game as Clipper reserves watch. Carl Lipani (44) takes the last shot for North Reading. 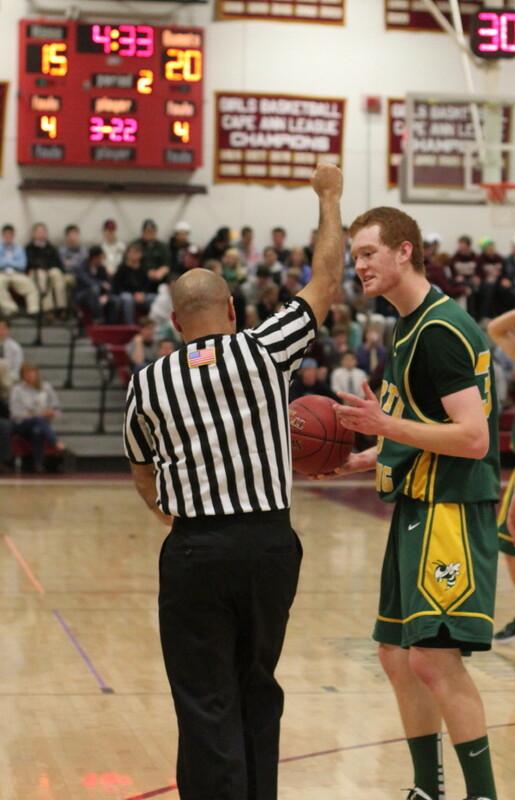 (Newburyport) The Clippers put together a nice package of scoring and defense in the final 4 ½ minutes and defeated North Reading, 53-48, in nonleague play on Friday night at Newburyport High School. This game was entertainingly close throughout. The Hornets had seven points leads in the 2nd and 3rd quarters while the best the Clippers could do up until the final minute was a 3-point advantage in the third period. The Clipper defense limited North Reading to only one point over the final 4+ minutes. 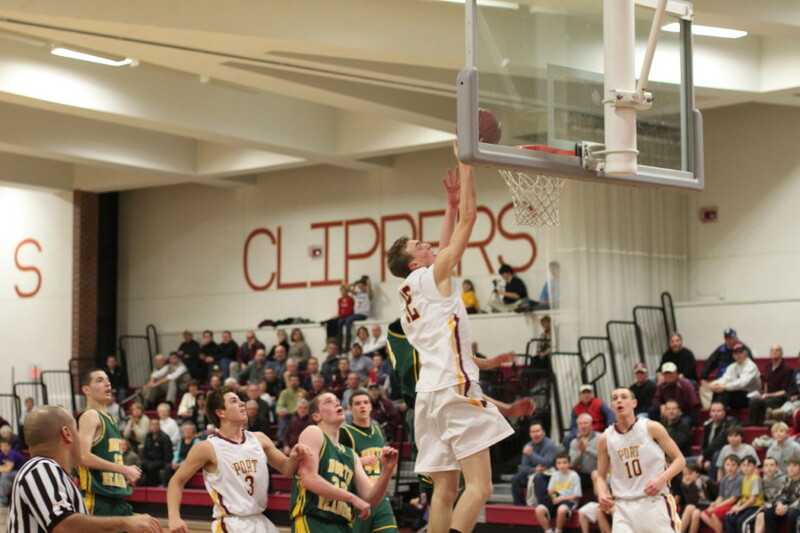 Alex Losh had a huge block when this was a one-point game down the stretch. Big block by Alex Losh (12) on Mike OBrien (32) late in the game. 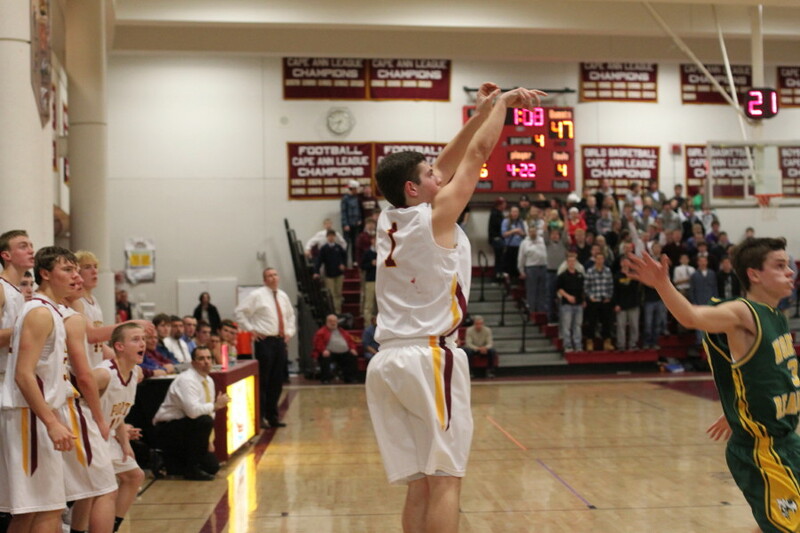 The late-game Newburyport offense fell into the able hands of Brett Fontaine trailing 47-42 with 4 ½ minutes left. On three straight possessions he took the ball right at the Hornet defense and came away with two baskets and two made free throws. Brett’s work gave the Clippers a slim 48-47 lead with 1 ½ to go. After an NR miss, the Clippers Ian Michaels broke into the middle of the Hornet defense and drew defenders with him thinking he would drive to the hoop. 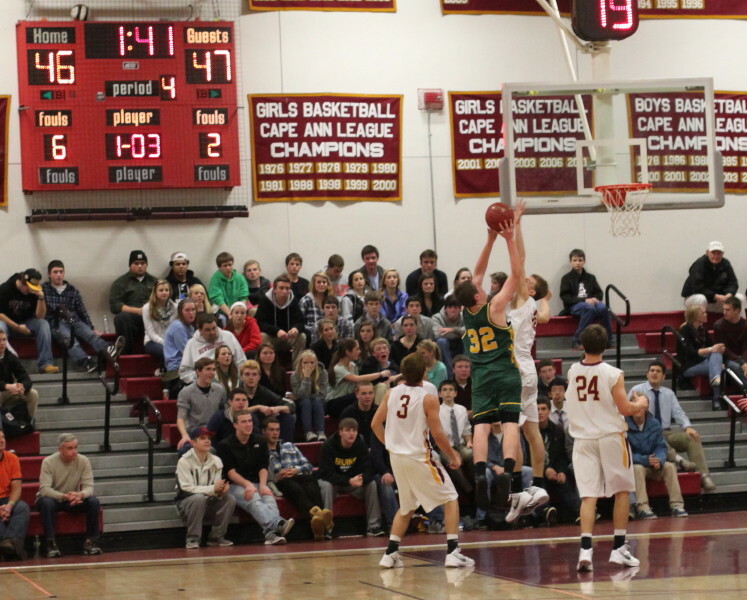 Instead he tossed the ball to Colby Morris alone in the corner in front the Newburyport bench. Bang! The Clippers had a 4-point lead (51-47) with a minute left. Mike O’Brien followed with a free throw. 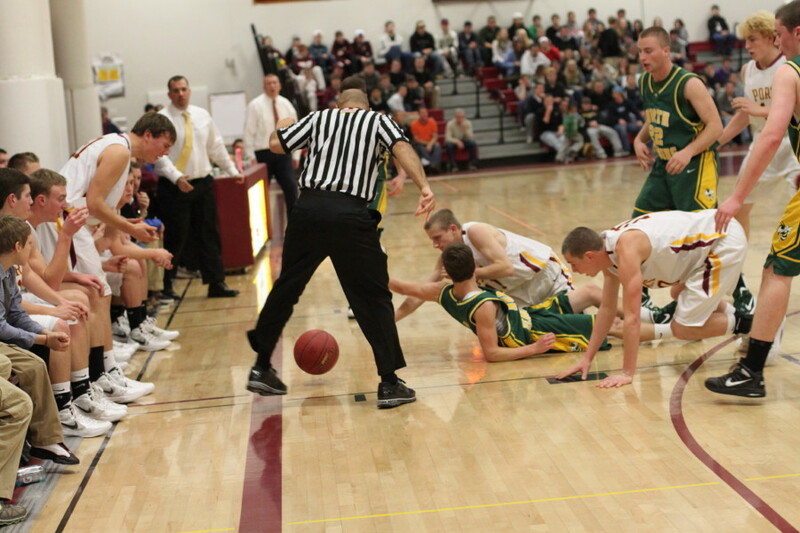 He missed the second attempt but teammate Kyle Boucher got the rebound and was fouled. He missed both – it probably didn’t help him shooting into the Clipper crowd directly under the basket he was shooting at. 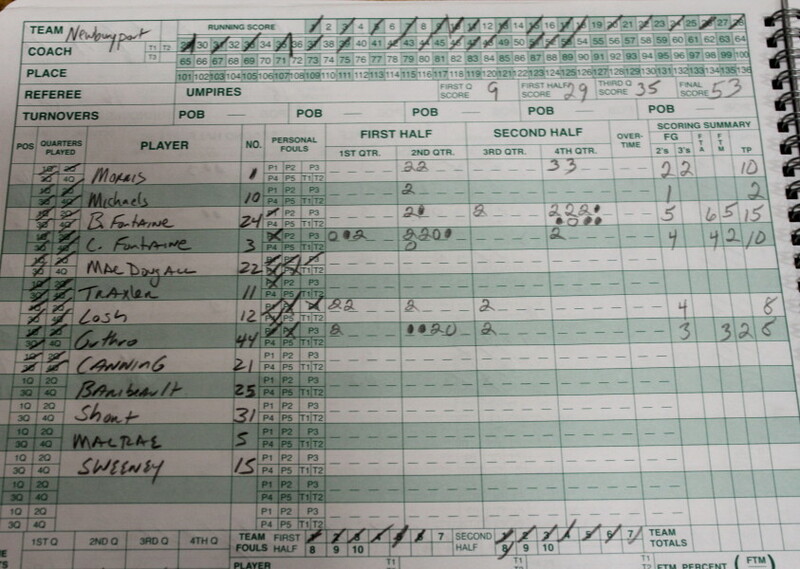 The Hornets were eventually able to commit enough fouls to send Brett Fontaine to the foul line with a one-and-one. He missed and that left NR with plenty of time, after a timeout with eleven seconds, to set up the game-tying shot. Carl Lipani ended up taking that final shot which missed. A couple of successful last-second Brett free throws closed the scoring. 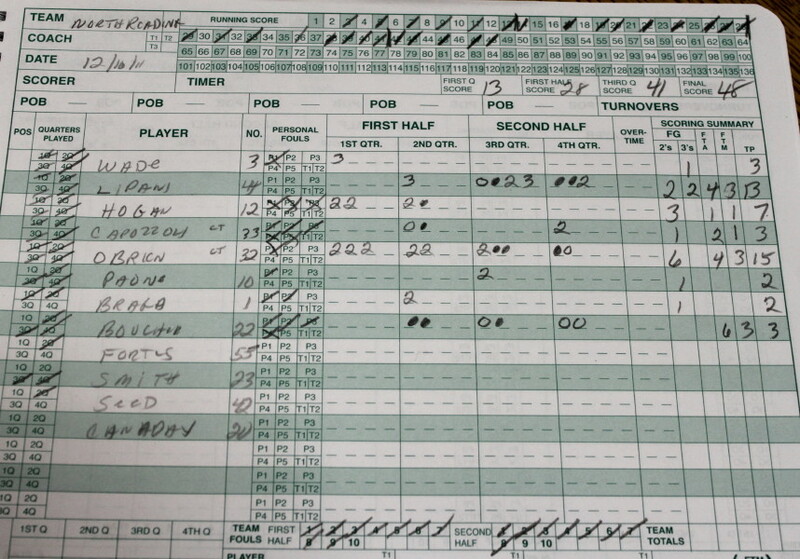 North Reading (0-2) had seven-point leads in the middle quarters but just couldn’t put up points down the stretch. 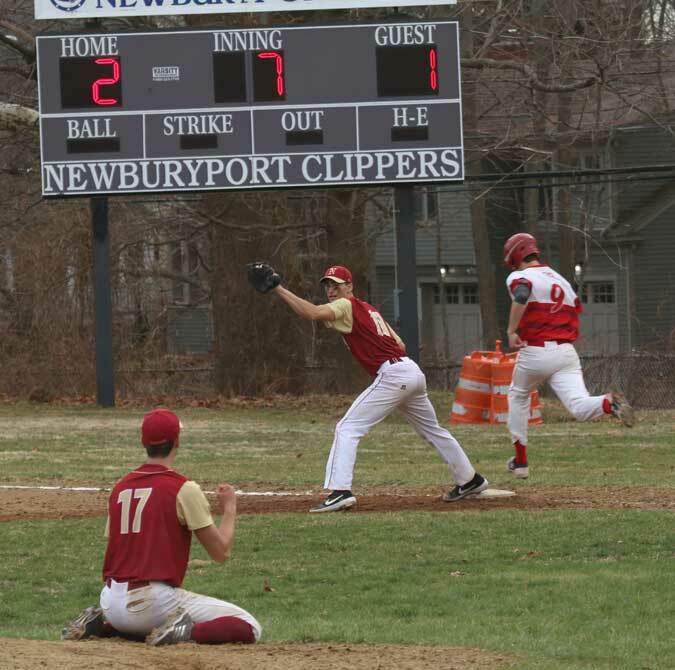 Newburyport (2-0) has rallied late to win both games so far. 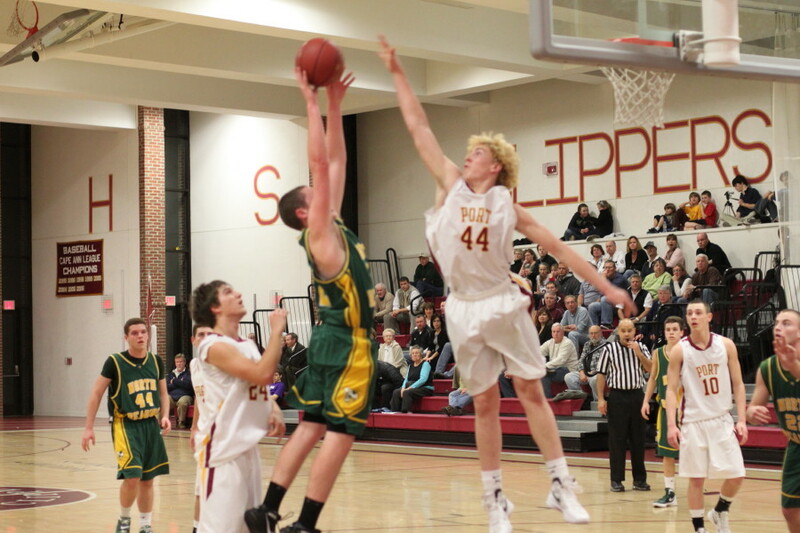 Dillon Guthro (44) goes for the block in the first half. The home-crowd pleaser was sophomore Dillon Guthro. He had at least four blocks by my count. Next for Newburyport is a visit to Hamilton-Wenham on Tuesday. HW coach Doug Hoak was on hand tonight. North Reading next visits Ipswich on Tuesday. Mike OBrien (32) gets inside Alex Losh (12) for two.